Sonic the Hedgehog is a 1993 redemption game manufactured by Leisure America and distributed by Sting International under license from Sega. 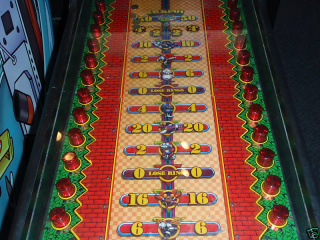 The game is played by inserting a coin which rolls toward a screen. Tickets are awarded depending on where the coin hits, similar in concept to ten-pin bowling. A double-sided promotional flyer was handed out to arcade operators to promote the game. Sonic the Hedgehog is Sega's answer to the demand for high powered, fast collection, redemption Sonic's many features include swift operator adjustments for complete ticket payout control and audit functions. You don't ask for higher collections, you capture them. Sonic has international mass market appeal and fame with dynamic sights and sounds direct from the record breaking video game Sonic the Hedgehog and Sonic the Hedgehog 2 which has sold millions and millions of cartridges for Sega's Genesis home entertainment system. A syndicated after school cartoon series, comics books, news releases, and a long list of record breaking sales to consumer markets worldwide, guarantee Sonic's success in the coin-op market for years to come. Three dedicated, interchangeable, playfield options which deliver diversified gameplay and ticket awards in less than 10 minutes! Revolutionary operating system is virtually maintenance free! Digital stereo sound and music, advanced tri-color dot matrix animated display, dynamic cabinet and playfield graphics, and operator adjustable attract modes, deliver high performance point of play attraction in any location. Sonic's challenging and proven gameplay is enjoyed by all ages. This page was last edited on 2 July 2016, at 11:37.